Mekk-Knight week on Pojo, and we start off with Blue Sky. 2000ATK isn’t too good for a Level 5, but its search ability is what helps Blue Sky be a real asset to the archetype. Same summon conditions and restrictions as all Mekk-Knights have, needing 2 or more cards in the same column and limited to one summon a turn for each color, and once per turn for their effects. When Normal or Special Summoned (from the hand) you get a Mekk-Knight monster search for every card your opponent has in the column Blue Sky is summoned to. A +2 off a summon is a great way to put you out in front. You can’t search doubles of the same Mekk-Knight, but that’s okay, you’ll have a different Mekk-Knight able to search out another Blue Sky. This monster can turn a dead hand into something better. The more cards your opponent has in a column, the easier it is to summon for you. If you can add to the column with a spell/trap to meet the requirements, any Mekk-Knight is live. When any monster you draw in the archetype can be live, it is one less thing to worry about. Cost-free search that will be a 1-for-1 at the least. This week was a week for me to pick some cards, so I decided to keep it simple and go for a Mekk-Knight themed week, staring off with Mekk-Knight Blue Sky. I will go ahead and get it out of the way that all of the Mekk-Knight monsters, excluding Avram, have a clause that lets you summon them from the hand to a column that has 2 or more cards in it and each Mekk-Knight can only be summoned that way once per turn. For simplicity, I will call this the Mekk-Knight Clause. Now with that out of the way, let us get into the effect and stats. Blue Sky is a Level 5 LIGHT Psychic with 2000 ATK and 2500 DEF. Stats are fine for a Level 5, LIGHT is a great attribute, and Psychic has some benefits, despite this or any Mekk-Knight not being Level 3 or lower. If Blue Sky is summoned from the hand, you can add Mekk-Knight monsters with different names up to the number of cards your opponent controls in the column Blue Sky was summoned in, excluding another Blue Sky. This is a hard once per turn effect. Searching is nice and Mekk-Knights are lucky enough to have two searchers. This one can search multiple cards if your opponent has multiple cards in that column, but I am sure most to all players will make sure to get at least one search off this effect. 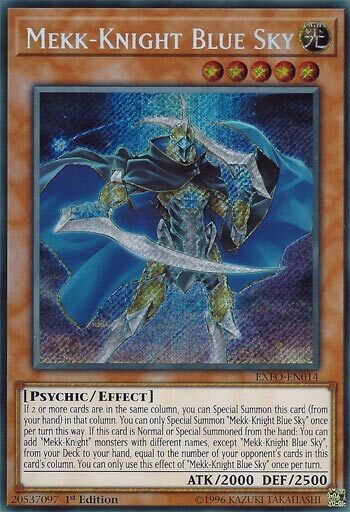 Blue Sky is one of the three staple Mekk-Knights in my opinion, and one of the two I feel you should always play three of. Art: 4.5/5 The Secret Rare helps, but Blue Sky is still gorgeous. Welcome to Mekk-Knight week! These are an interesting enough series of cards, they work on what happens to be in the same column (or columns) and like to Special Summon. Blue Sky is up today, who is a Light, Level 5 Psychic, which are good things. As a whole, I feel Psychics are a pretty ignored type (save things like Psychic Tuners especially back in the DAD/Emergency Teleport days, which can still pull of tricks). 2000 attack is lackluster for Level 5, but 2500 defense is good. So Blue Sky can be Special Summoned from your Hand as long as it’s into a column that has two cards or more are all ready there. If Normal or Special Summoned from the Hand (versatility is good) you can add Mekk-Knight Monsters from the Deck to your Hand equal to the opponent’s cards in the same column. These are both once per turn effects, but as you see, and referenced at the start, these guys like to move fast, and they try to turn resources and advantage in your favor based on what the opponent has. You can’t add another of the same card (Blue Sky himself) via the effect, but this Deck wants to be fast, and it can be. It’s not the easy Deck to generate +s off, but the speed helps offset that.